Home » Home » News » Don’t Stop, Believ… erm. Journey. 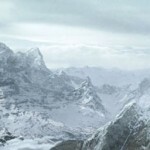 “An exotic adventure with a more serious tone, Journey presents TGC’s unique vision of an online adventure experience. 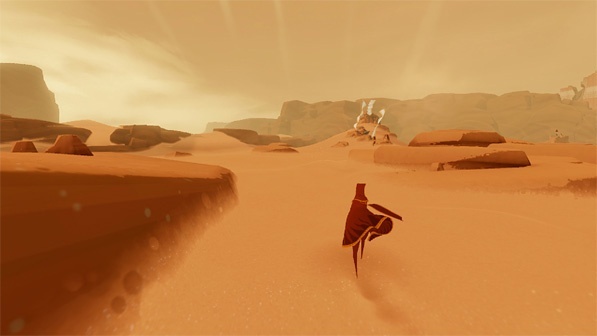 Awakening in an unknown world, the player walks, glides, and flies through a vast and awe-inspiring landscape, while discovering the history of an ancient, mysterious civilization along the way. More details are set to be revealed soon, but in the meantime you can feast your eyes on those screenshots. Did I mention that they look stunning? 7 Responses to Don’t Stop, Believ… erm. Journey. Wow. 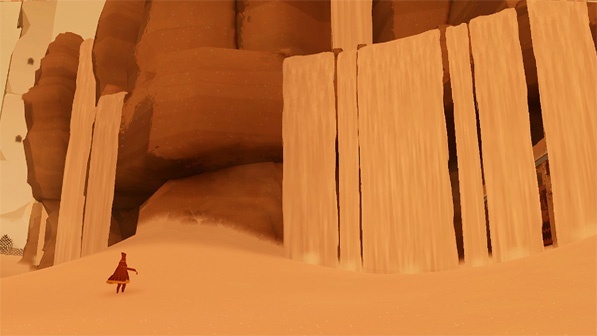 I greatly enjoyed Flower and Flow, and it looks like Thatgamecompany will be getting a few more of my ducats. Those visuals are simply stunning, and I’m intrigued by the almost… Demon’s Souls-ish approach to online. Good find Gregg! Should I go ahead any play Flower? I know it’s had many great things said about it. I just don’t really “get” it, and am slightly put off by the developer’s proclamation of a general dislike for games. 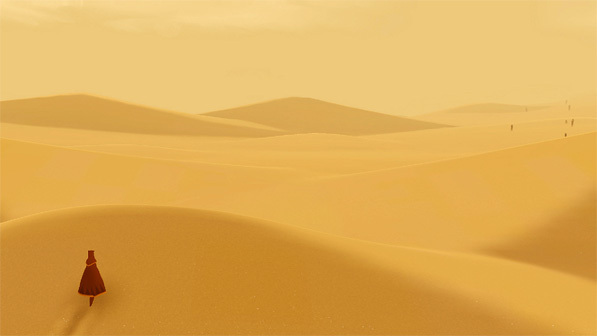 Those Journey screenshots are quite…vivid, in their own special way. @Xtal, having seen flower at my brothers recently it’s a very relaxing, impressive looking experience. But that is all. There’s really nothing too it. I don’t believe there’s nothing to it, but like Rez it’s a very experiential game. It’s sensual rather than cerebral and if you’re one of those people that gets excitable over the pretty cherry-blossom scenes in many a Japanese film or series then you’ll call it art and collapse from eye candy rot. Me? I thought it was beautiful and like Lew says relaxing but it’s just a very picturesque collect ’em up with a few tedious and rudimentary ‘puzzles’/tasks thrown in for good measure. I also got a trophy for leaving it on the title screen for 10 minutes which is quite frankly obscene. I personally couldn’t recommend Flower unless you had the aforementioned cherry blossom disposition but I could certainly turn you towards Everyday Shooter because it works on a similarly simple concept but wrings much more from it and is every bit as enthralling aurally and visually. I love it and the soundtrack is superb. I’ve just been saying to Lewis, I hope Journey doesn’t try to pull me along simply by the virtue of its aesthetics. I hope there really is something else worth discovering other than another pretty sight. Well, the preview that I read on IGN mentions puzzles you encounter along the way that you have to solve to reach the mountain so… it could, in theory be THE perfect blend of, say Ico and Demon’s Souls… I know I want it to happen!! I liked Flower for the same reasons Gregg did, it’s relaxing and cherry-blossom beautiful. It felt very organic to me. I don’t recall what I paid for it… I think it was around $9, which is too much for what you get, but I’ve spent more money on things that entertained me less (I’m looking at you, Far Cry 2). If it’s on sale on PSN, I’d say go for it. Wow, if Ico and Demon’s Souls got together and had a baby… that’s both scary and alluring. @Meho: Ooo, now that sounds tasty. Hopefully there’ll be a video to chew on soon so we can see what it’s like in motion. I’m betting it’ll look delicious. @Steerpike: I know what you mean, it felt like there wasn’t enough meat on the bo- ah, there I go again. You could do much worse with your money xtal. And that would be one horny baby. One seductive horny baby.